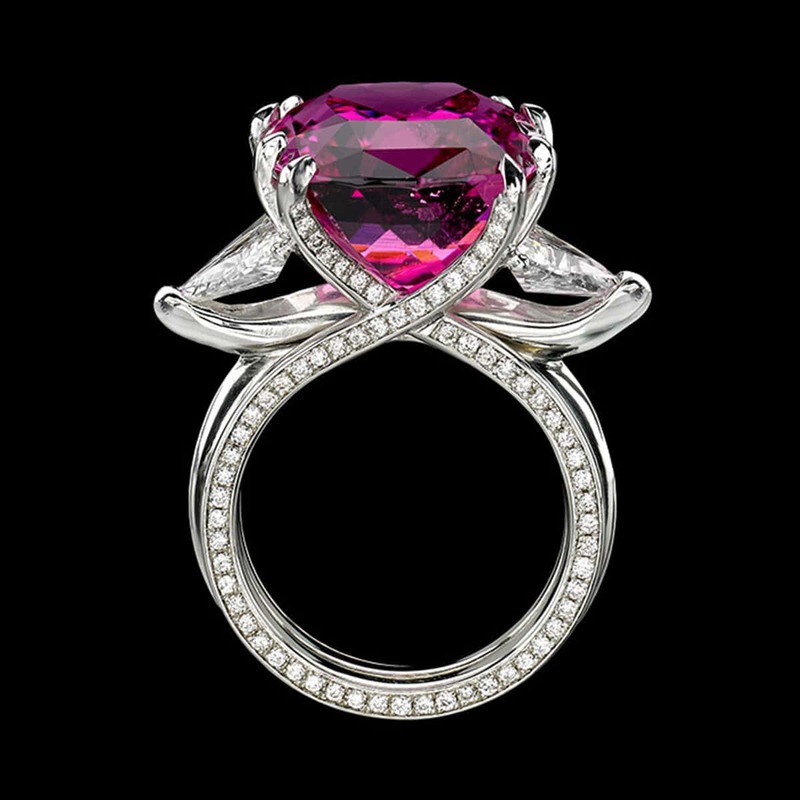 Tourmaline has an undeniable allure, from rosy rubellite and enchanting emerald-colored, to the exotic, electric-blue Paraíba. This versatile gemstone has been cherished as a talisman and treasure throughout history. Its dazzling range of more than 100 hues delights designers and jewelry-lovers with a lavish palette of colors. Tourmaline originates from many places around the globe. 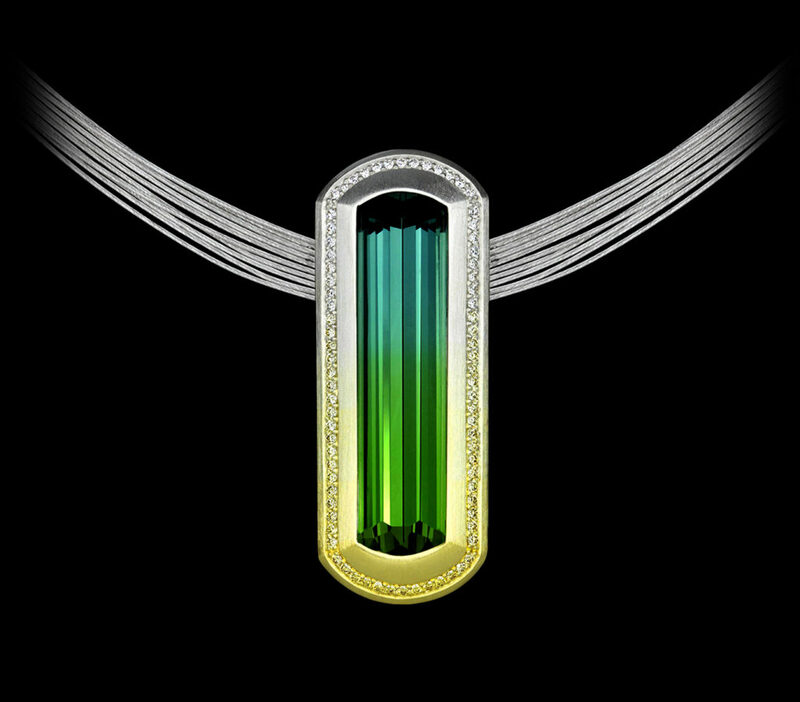 Brazil and sites throughout Africa produce most of the world’s tourmaline. Other mining include Pakistan, Sri Lanka, Afghanistan, and North America. The gem has even been uncovered in Australia, Italy, and Switzerland. 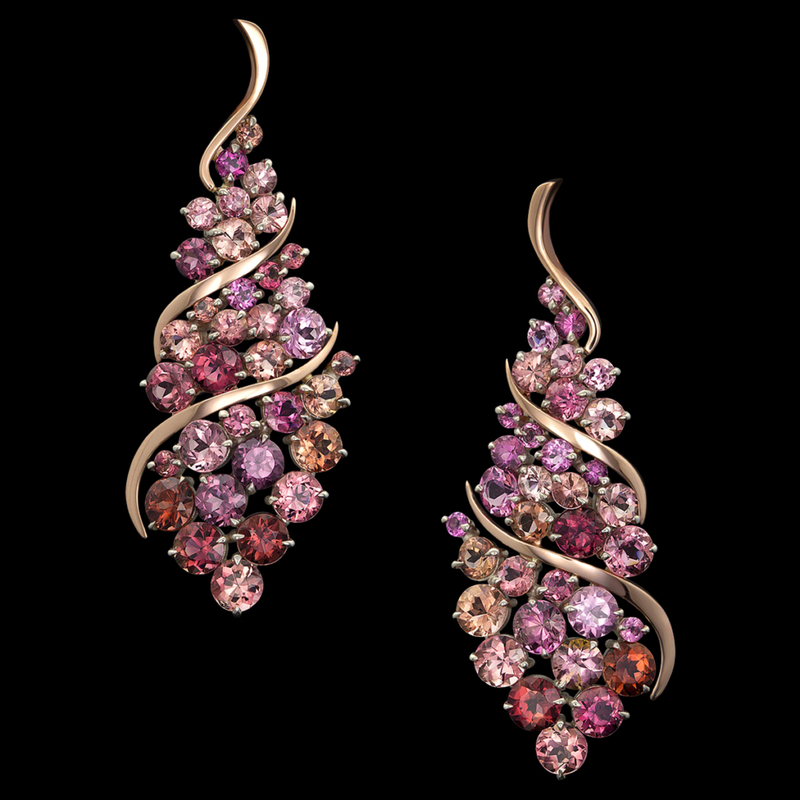 Tourmaline originates from many places around the globe. Brazil and sites throughout Africa produce most of the world’s tourmaline. Other mining locations include Pakistan, Sri Lanka, Afghanistan, and North America. The gem has even been uncovered in Australia, Italy, and Switzerland. 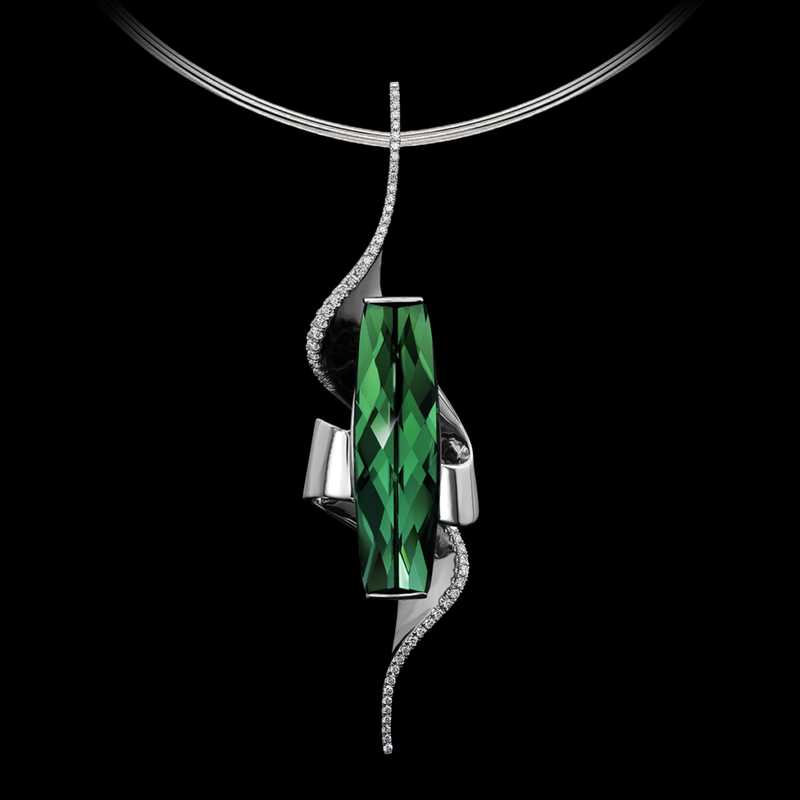 The name tourmaline derives from the Sinhalese “toramali” meaning “stone with mixed colors”. Specimens usually contain more than one color within a crystal, resulting in what gemologists call bi-colored or parti-colored gems. Tourmaline includes a wide color range with seemingly endless variations in tone and intensity, making its nickname, “gem of the rainbow,” a great fit. 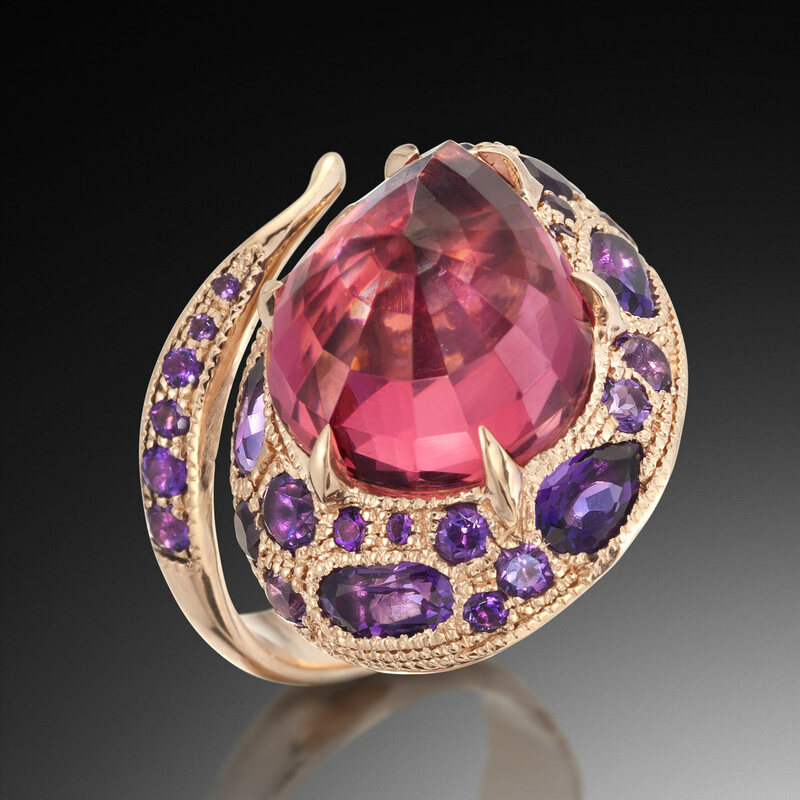 Tourmaline is fairly tough and relatively hard, showing up between 7-7.5 on the Mohs Scale. 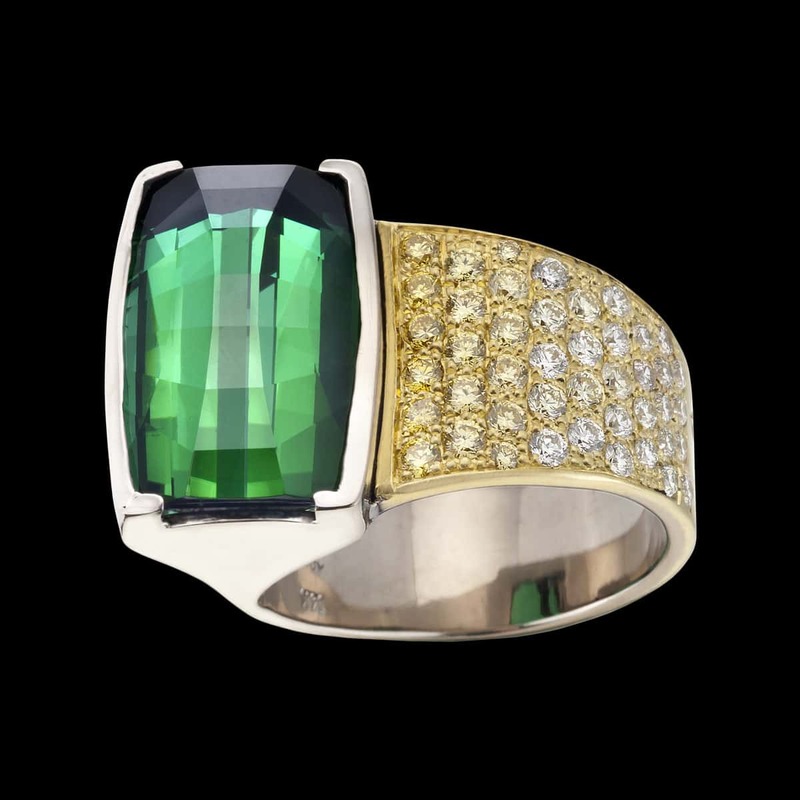 Ancient Egyptian legend tells the tale of tourmaline making an epic journey from the center of the earth and finally gliding across a rainbow’s surface, collecting its many colors. 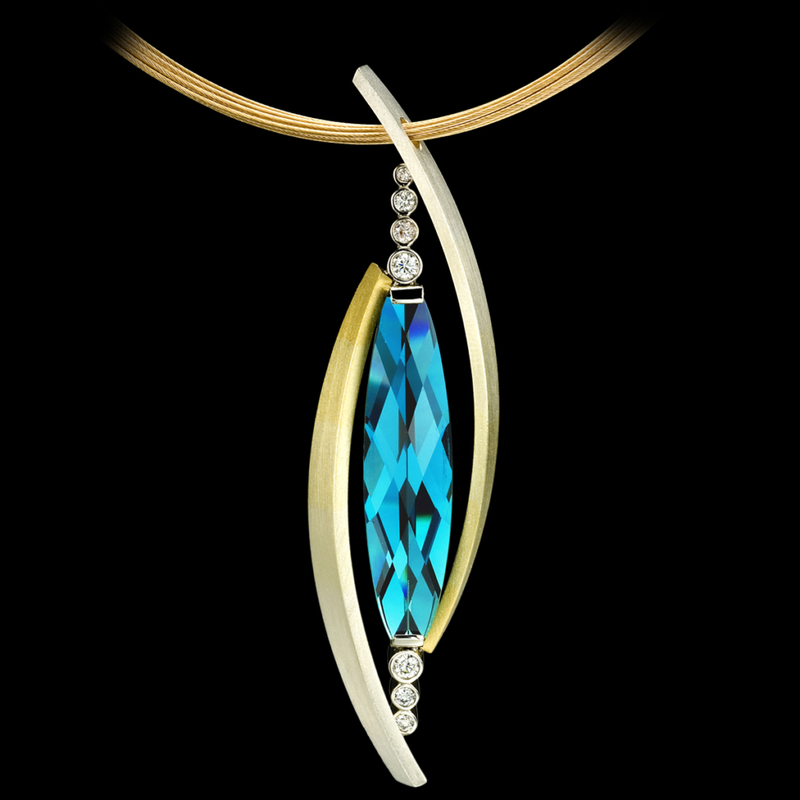 Others believe the gem stimulates artistic inspiration and intuition, making it a trusted talisman to artists and writers through history. Tourmaline are not only vivid in color; sometimes their optical properties seem almost magical, adding to their appeal as a luck charm. 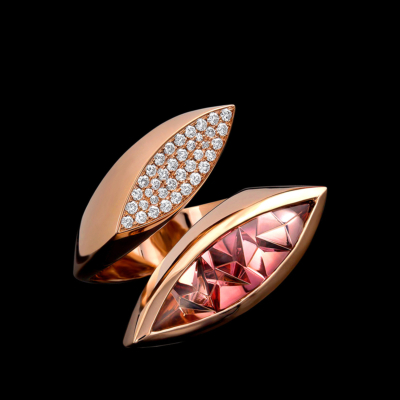 In special cases inclusions, can give the gemstone chatoyancy, also known as the “cat’s eye” optical effect, or even create a kind of glow, as with the Paraíba variety. 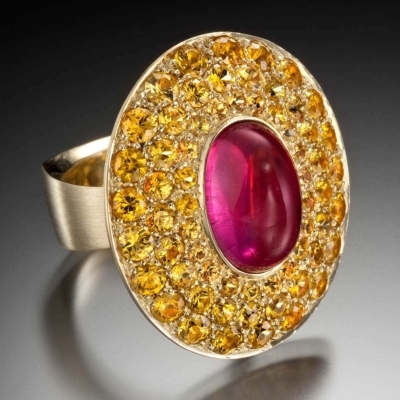 Tourmaline is also pyroelectric, which means they can generate electrical current, especially when heated or rubbed. This peculiar quality was noted and admired long before it was understood scientifically. The Dutch knew tourmaline as the “aschentrekker” or ash-puller, and pipe-smokers of the day employed heated tourmaline to draw out ash from within Meerschaum smoking pipes. Paraíba tourmaline, sometimes called “neon” or “electric”, is a rare, variety which is one of the world’s most coveted gemstones. 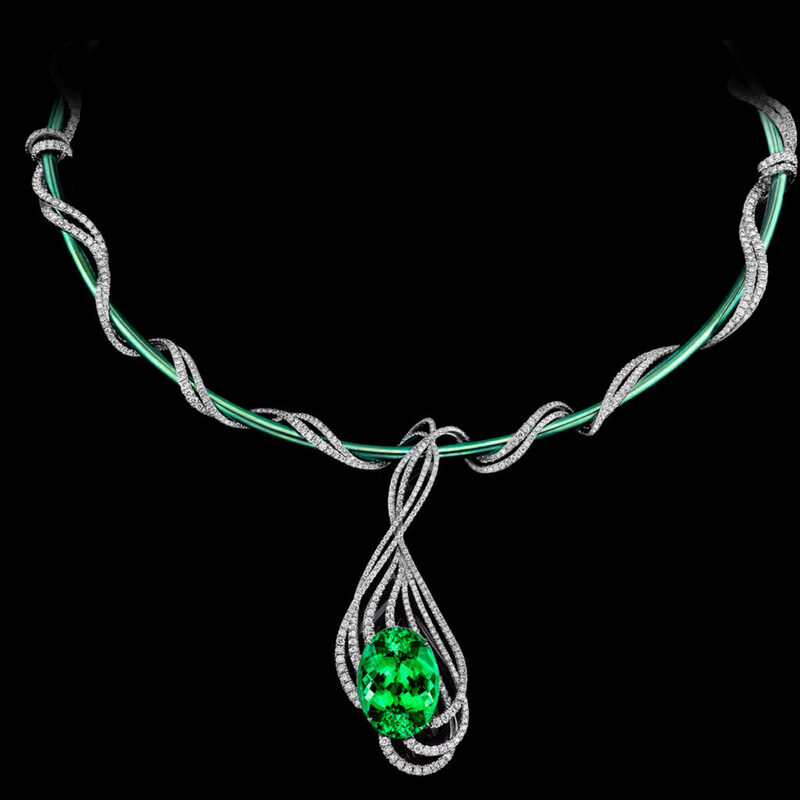 Found within the green-blue to blue-violet color range, this special type seems to glow, as if lit from within. This magical appearance, created by copper inclusions, makes paraíba tourmaline one of the highest valued gems on the planet. 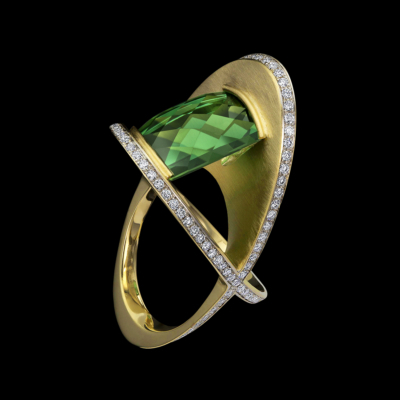 For more detail, read our post all about Paraíba Tourmaline. Deep red and magenta tourmaline represent a highly-desired category known as Rubellite. 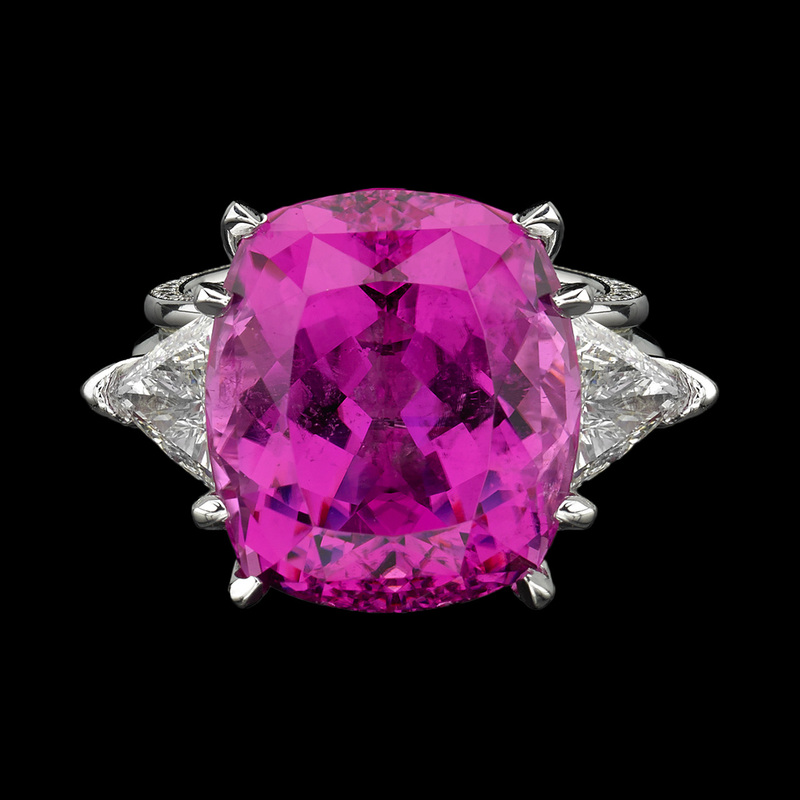 These beautiful gems were often mistaken for rubies before the rise of modern gemology. 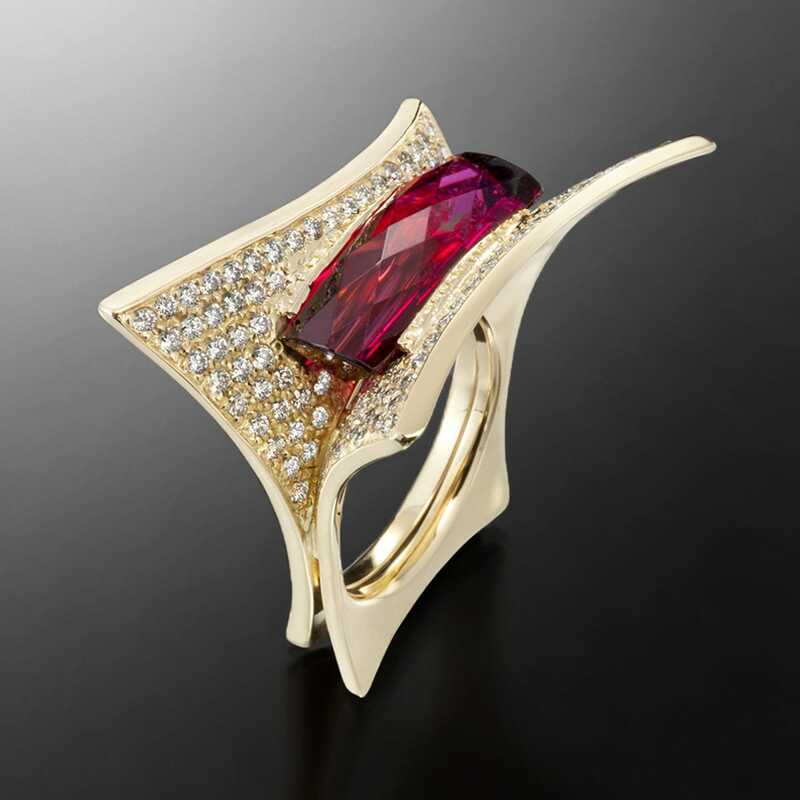 From within the red to pink color-range, the name Rubellite is reserved for specimens with especially rich and vibrant color. 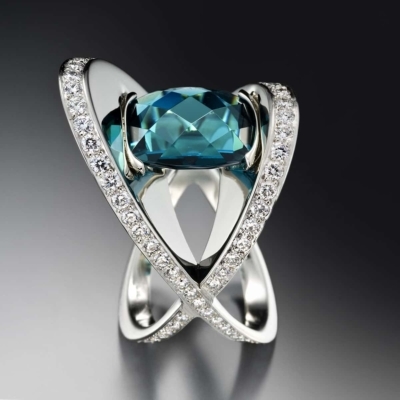 Though it’s natural crystals often contain multiple colors, cut tourmaline gems typically show only one color. When a specimen can be carefully cut to exhibit multiple colors, the result is stunning. One such example is seen in Adam’s award-winning Ombré pendant, which exhibits a green-yellow tourmaline cut by Stephen Avery. 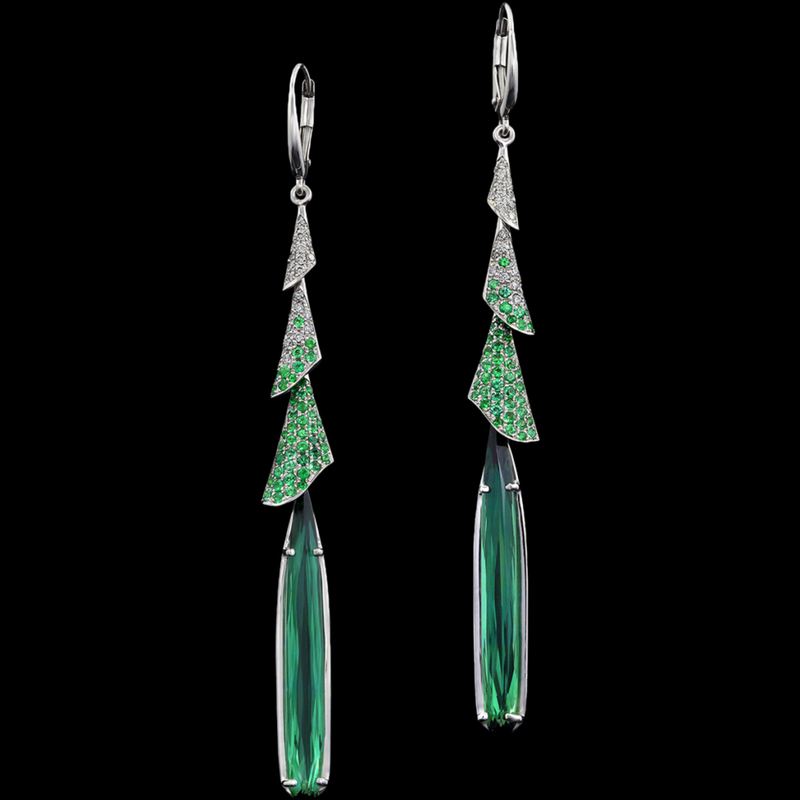 Collectors and designers also delight in green tourmaline, especially the rich emerald variation called “chrome tourmaline”. 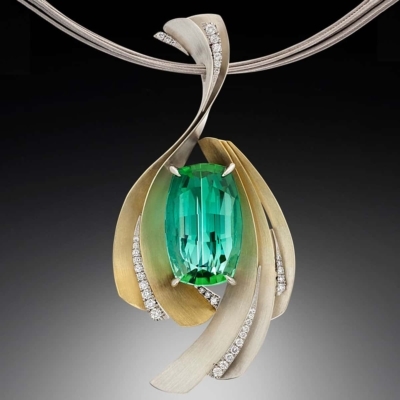 Oracle necklace, above, displays a magnificent 17.83 carat chrome (cuprian) tourmaline. 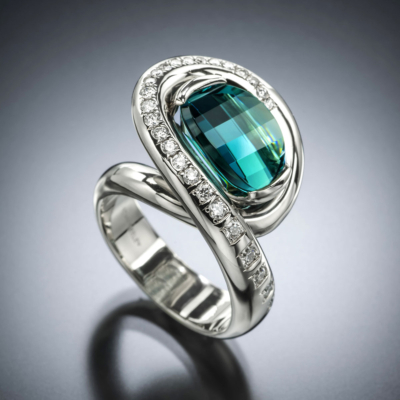 We hope learning about tourmaline has inspired you! 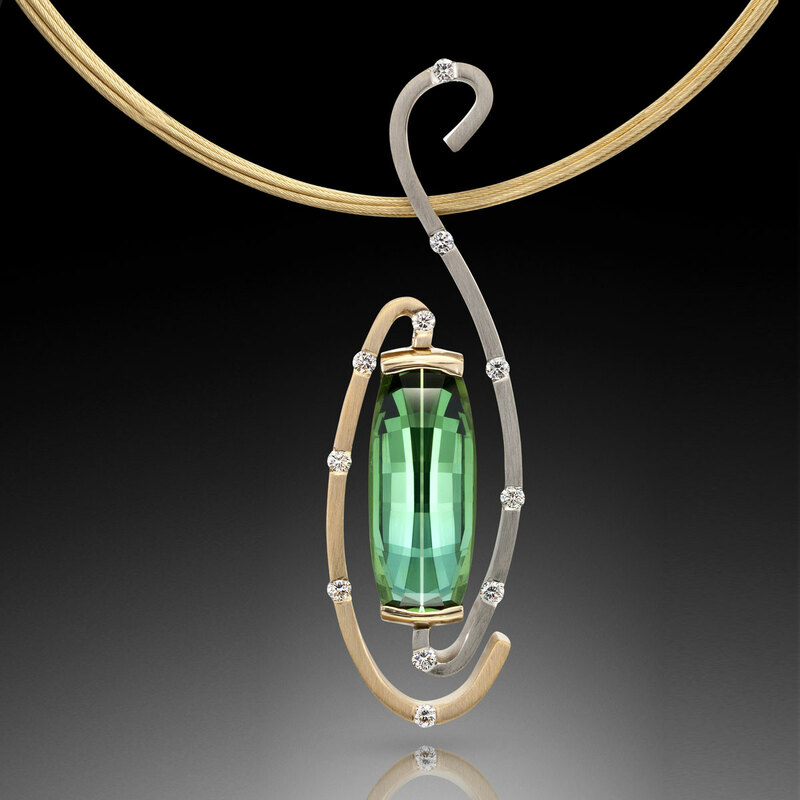 At Adam Neeley Fine Art Jewelry, we’re thrilled to offer the finest tourmaline available, including work by award-winning lapidary Stephen Avery. 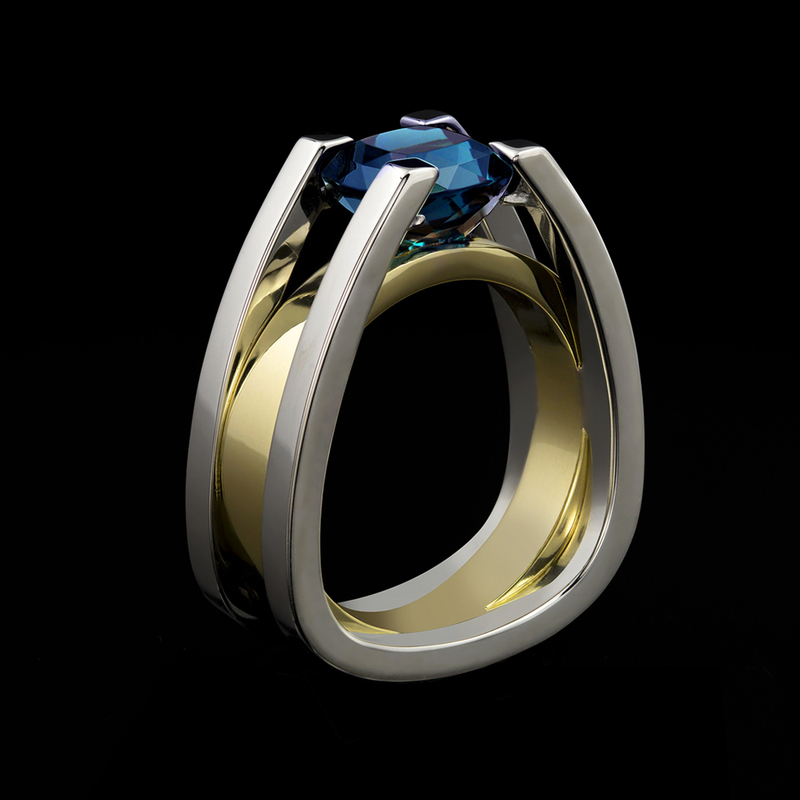 From world-class gemstones, to signature alloyed metals and award-winning designs, we’re committed to creating unique and exceptional jewelry. Thank you for sharing in our passion. 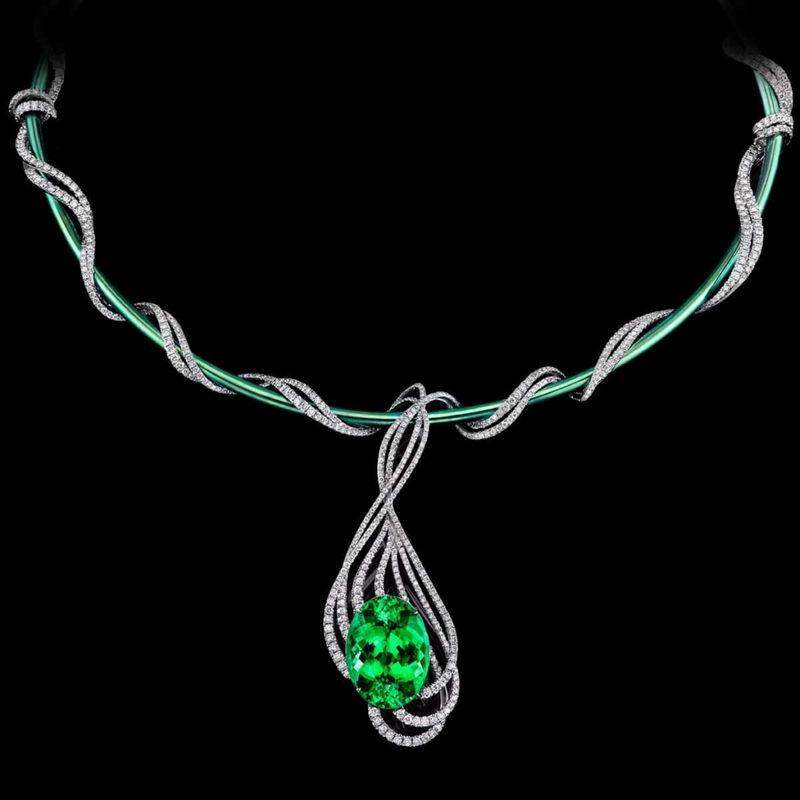 To see Adam’s newest one-of-a kind designs, including tourmaline jewelry, click below! Schumann, Walter. Gems of the World. Sterling Publishing Company, Inc., 2009. Tourmaline. 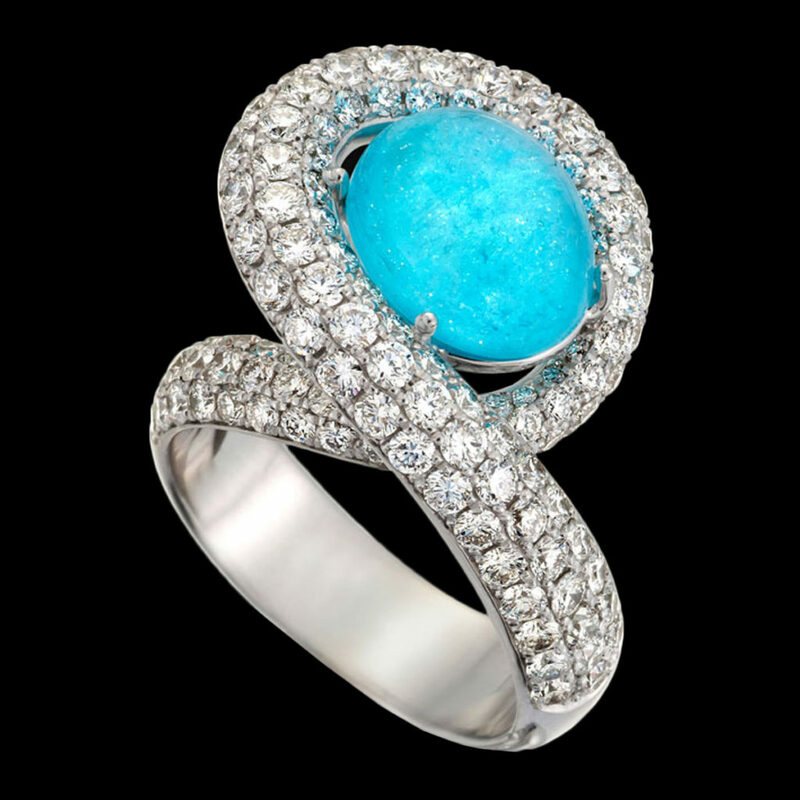 “The Passion of Colored Gemstones”. GIA, 2018. PDF. Neeley, Adam. Personal interview. 13, Nov. 2018. To ask a question about a jewelry project, submit this form and we’ll respond promptly.